Humor is another key point in our game, so when designing characters we always tend to think of silly stuff for each family time and origin and then mix it with their visual appearance. 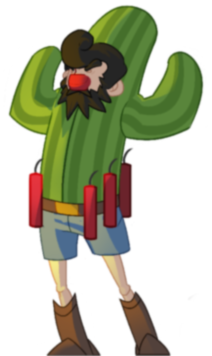 For example, one member of the western family is a guy customized as a cactus… LOL! we believe this kind of silly humor actually fits pretty well in this game. So the style we are using for in-game art is mainly pixel art. 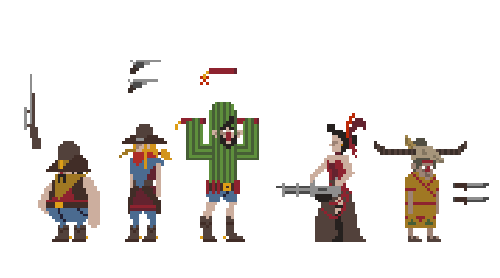 In the following art posts we’ll get into details of character creation and animation process, but mainly, the overall process is designing characters through high-res concept sketches, not only digital, but traditional drawings too, and then bring them into pixel art to test few more variations in there. Once the whole family members are done, we can start animating. The characters and the effects are created in a 128×128 canvas, and most of the characters are 30-60 pixels tall. The background is pixel art as well, but has a little bit more resolution. I hope, you guys find this post interesting. In the next posts we will deeply talk about the concept process, the animation, the high-res images, the background, the effects… anything related to art!